I am not a big fan of the game of Monopoly. It’s probably because I’m not very good at it; the last several times I’ve played, I’ve struggled to hold onto even one monopoly, and have been the first player to be bankrupted out of the game. John, on the other hand, loves Monopoly. 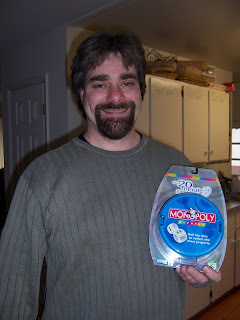 Consequently, it was no real surprise to me when he unearthed a Monopoly tournament and signed up to play this weekend. In the interests of Supporting Spousing (God knows John has suffered through enough of my endeavors), I told him I’d go along. Bright and early this morning we set off for the Lorton Glory Days restaurant, the venue of the event. John hadn’t given me too many details about the tournament, except that there were two rounds of about a hour and a half apiece, and breakfast and lunch were included. I’d brought along a magazine to occupy myself while he played, since I expected to be somewhat bored. Much to my surprise, there was a good-sized and enthusiastic turnout for the tournament; approximately thirty to thirty-five players, ranging in age from kids to senior citizens. There was a preponderance of males – probably a 4-to-1 male/female ratio. The main sponsor of the event, Ronald A. Kowalski of Long & Foster Realtors, had gone all out with a display in front of the restaurant. I didn’t know until I got inside that Mr. Kowalski was sponsoring the event as a fundraiser for The Lorton Arts Foundation, which is in the process of creating a visual and performing arts complex out of the old Lorton Prison. I’ve been driving past the defunct prison for years and have always thought, “Gee, wouldn’t this be a great place to put a theatre?” Well, there will be a theatre there eventually, along with lots of other exciting things. So that made me feel better about spending my morning surrounded by Monopoly wonks. 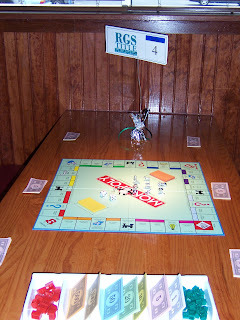 There were five tables set up with brand spankin’ new Monopoly games and seating for six players. Each table was sponsored by a local business (this is a photo of John’s table, sponsored by RGS Title). 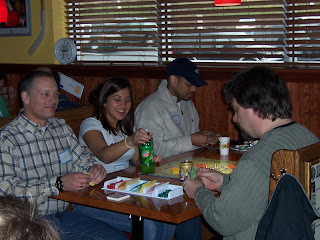 Coffee, donuts and bagels were provided by Glory Days, and the older players occupied themselves with grabbing some breakfast, while the younger players headed immediately to their table and began laying out their money. I parked myself at an empty table, cracked open a V-8 juice (I’d brought along a small cooler with some snacks), and read some of the flyers about the Lorton Arts Center (it’s going to be rather amazing). At 9:30 the players were summoned to their tables, a brief rundown of the rules was given by Mr. Kowalski, and the tournament began. At first, things were fairly quiet as the players focussed on getting around their boards and snatching up properties whenever possible. The table closest to me was comprised of two young men in their twenties and three boys somewhere between the ages of nine and twelve (their sixth player never showed up). I expected them to be fairly rowdy, but they were a pretty silent and intense crowd. John’s table was livelier, with a nice mix of an older lady, a fellow a bit older than John, a thirty- something guy and a perky young lady in her late teens/early twenties. The Perky One kept up a barrage of constant chatter, but she was actually rather sweet and her presence loosened up the proceedings quite a bit. I tried not to hang around the table too much; but it was clear early on that Bernard (the thirty-something) had a killer instinct. He quickly finagled Judy, the Older Lady, into trading with him for his first monopoly, and from then on he never looked back. The first hour ticked by, and eventually Bernard bankrupted the Perky One, then the Older Fella. Bernard and John were at a standoff; John held the remaining Railroad that Bernard wanted, and Bernard had Mediterranean Avenue, which John needed to go with his Baltic Avenue. Bernard wanted a straight trade, but John refused to give him the Railroad monopoly without something to sweeten the pot. They stayed deadlocked throughout the game, right down to the end. John and Judy hung on by their fingernails, but it was clear that Bernard had triumphed and would move on to the finals and eligibility for the big cash prize of $1,000. There was a half-hour break between the first and second round, and Glory Days dished up a nice lunch for the players and their hangers-on. Mr. Kowalski presented a round of door prizes (John won a 20-minute version of Monopoly, of which I heartily approve) and introduced some of the other sponsors of the tournament, as well as a rep from the Lorton Arts Center. Judy, John and I ate some salad with grilled chicken, then I went over for a chat with the Art Center rep as the final round started, on a fabulous deluxe version of the game. Eventually I finished my conversation and joined John and the others watching the game, which was quite intense. 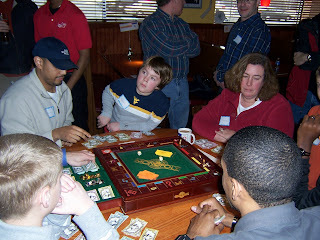 The finalists consisted of Bernard, two young men roughly Bernard’s age, one boy about eleven and another about nine, and the younger boy’s mom (they must have spread the family out so they didn’t play at the same tables during the first round; Dad was also present, along with another son, slightly older son). With the onslaught of the weekend lunch crowd, the restaurant staff had turned on the multiple televisions in the place, and the nine-year old, whose name was Matt, was constantly distracted by them. In this picture you can see him watching a nearby screen intently, while play continues around him. I figured his inattention would get him bumped from the competition early, but I was wrong. 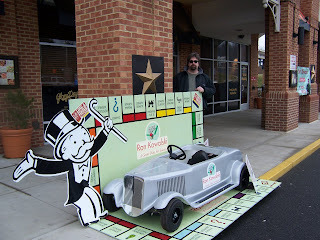 The little stinker snagged Boardwalk and Park Place in short order, and nearly bankrupted himself by buying houses for his monopoly just as fast as he could. There were a few tense turns where he landed on others’ properties and had to sell a house or two just to keep his head above water, but then the tide turned, and people started landing on Boardwalk. And just kept on landing on Boardwalk. Down went the first of the two young men, down went the other kid, down went the mother. Matt took all their money and all their properties, still keeping one eye on the omnipresent TV sets. Bernard was starting to look worried, as was Amin, the other remaining player. Matt bought houses and hotels for his new properties (the onlookers began referring to him as “Trump”), while Amin and Bernard struggled to stay afloat, heaving sighs of relief when the Community Chest or Chance cards sent them careering safely past the death corner of Boardwalk and Park Place. Even jail was preferable to the tension of traversing young Matt’s Board of Death. Eventually, inevitably, Amin landed on Boardwalk and was wiped out. Matt carelessly scraped Amin’s holdings into the pile in front of him and bought a few more houses. Bernard was on the approach to the Death Corner. If he rolled a four or a six, he would be destroyed. Anything else, and he’d pass “GO” safely one more time. Bernard rolled a four and landed on Park Place. Matt, who was watching “Spongebob Squarepants” on the TV over his shoulder, was completely unaware of his victory until the groan rose up in unison from the onlookers. 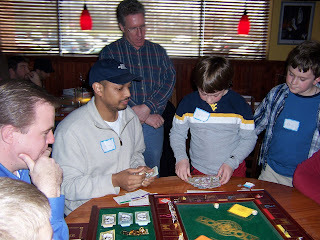 Amin got the third place award of $250, Bernard took the second place prize of $500, and the nine year-old kid with absolutely no expenses and almost no interest in the game took the grand prize of $1,000 and went home with Mom and Dad. There’s irony for you. John had a good time, though, and it was nice to see the local businesses coming out to support the new Arts Center. And I even had a good time. John and I went home and relaxed for the rest of the day. After dinner we even played a round or two on his new 20-minute Monopoly game. Oops! 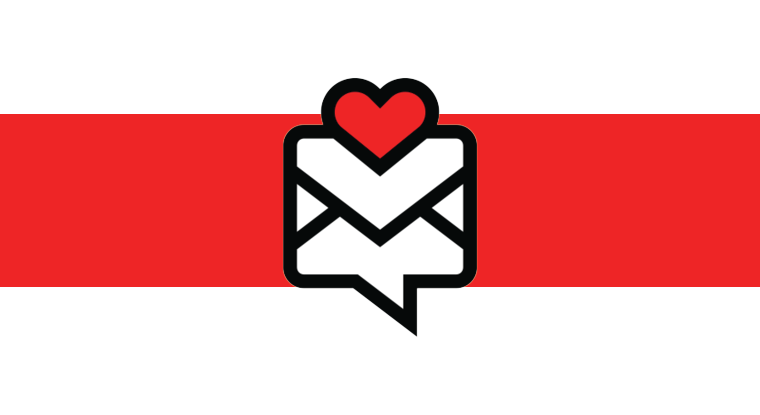 Fixed – thanks for the correction. Sounds like a good time was had by all.AND…perhaps Donna and Co. can do a fundraiser for the Arts Center!! !Love it that the prison is going to be turned into something lively and creative!!! I wanted to go but had to work. Sounded fun though!